I saw this sign while returning movies to the renatal store late one night. Fortunately the sign was still in place the next day allowing me to get a photo. 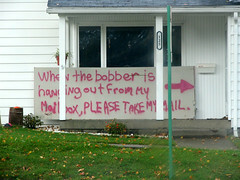 The sign reads: "When the bobber is hanging out from my mailbox please take my mail." I applaud whoever created this sign... my mail often gets "forgotten" too. Awwww good ol' Vicksburg. I miss that town!